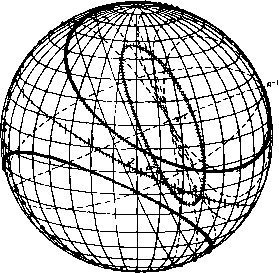 SPHPLT Spherical grid CalComp plotting routines which generate a perspective drawing of the celestial sphere as seen from any orientation and plot user-specified lines, points, or other characters on the sphere. A sample plot is shown in Fig. 20-4. 1. Berg, R. A., and M. A. Shear, High Energy Astronomy Observatory-A Attitude Ground Support System Design and Development Methodology, Comp. Sc. Corp., CSC/TM-76/6134, June 1976. 2. Chu, Ben, Structured FORTRAN Preprocessor (SFORT), Comp. Sc. Corp., CSC/TM-77/6256, Sept. 1977. 3. Dahl, O. J., E. W. Dijkstra, and C. A. R. Hoare, Structured Programming. New York: Academic Press, Inc., 1972. 4. Fliegel, Henry F., and Thomas C. Van Flandern, "A Machine Algorithm for Processing Calendar Dates," Communications of the ACM, Vol. 11, p. 657, 1968. 5. Hoover, J. E., T. E. Board, and A. M. Montgomery, Graphic Executive Support System (GESS) User's Guide, Comp. Sc. Corp., CSC/SD-75/6057, Aug. 1975. 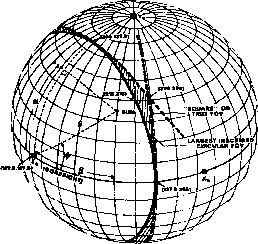 6. International Business Machines Corporation, IBM System/360 Operating System Graphic Subroutine Package (GSP) for FORTRAN IV, COBOL, and PL/1, GC27-6932, Nov. 1972. 7. Myers, Glenford J., Reliable Software Through Composite Design. New York: Petrocelli-Charter, 1975.